The Spirit of de Grisogono at 312.24 carats is the world's largest cut black diamond, and the world's 5th largest diamond, period. In a white gold mouting, it is set with 702 white diamonds totalling 36.69 carats. There are not many black stones in the world of famous diamonds, mainly the Black Orlov and the Amsterdam Diamond, which weigh 67 and 33 carats, respectively. (A 205-carat black diamond called the 'Black Star of Africa' is rumored to exist, being sold to a buyer in Asia during the 1980's, but this has never been substantiated.) The man behind this fascination is famous Swiss jeweler de Grisogono. He was the first major jeweler to create eye-catching collections of black diamond jewelry and watches. He is also responsible for cutting the Gruosi Diamond, the largest heart-shaped black diamond in the world. The diamond weighs 312.24 carats. This diamond originally had a rough weight of 587 carats and was mined several decades ago in west Central Africa before being imported into Switzerland. It was then cut using the Mogul diamond cutting technique. This historic cutting method was developed centuries ago in India and can be seen in a number of historic diamonds, such as the Orlov Diamond in the Russian Diamond Treasury in Moscow, and several diamonds in the Crown Jewels of Iran, amoung them the Taj-I-Mah Diamond. The Great Mogul, a 279-carat diamond, is another famous Mogul cut diamond, but sadly, its whereabouts are unknown. The more modern rose cut is a variation on the old Mogul cut. The entire process from studying the cut design to executing it on the de Grisogono rough involved more than a year's work. Henri Leconte and his wife, who is wearing the Spirit of de Grisogono ring. The Spirit of de Grisogono is described in the report of the Gubelin Gem Lab as a rare specimen for this type of diamond in view of its great size. 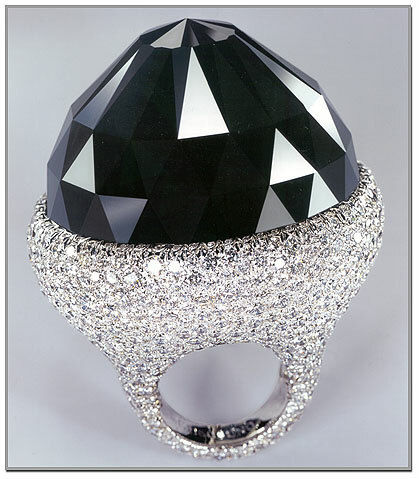 It is the largest natural black diamond which the GGL laboratory has ever tested. The stone is reported to have since been sold by Fawaz Gruosi to a private client.